Home / Are Dental Implants Safe? Dental Implants are one of the safest, most successful forms of tooth replacement available. In fact, dental surgeons recommend dental implants more than any other form of tooth replacement- even over bridges and dentures. But are dental implants safe? Let’s take a look. The procedure starts as the surgeon administers local anesthetic. Then he will drill holes into the jawline and insert the implants. These implants will act as fasteners or anchors for the new teeth, locking them in. Once the procedure is over, the specialist will prescribe some pain medication to deal with the minor pain that can follow. Most patients experience some facial swelling and discomfort in the few weeks after the surgery. They may not be able to eat hard or crunchy foods for up to eight weeks either. As with any surgery, there are some small risks. Infections are the most dangerous ones, but it is very unlikely that you will suffer from any infection cause by a mistake during surgery. There is also the risk that the surgery will not be successful and will need to be repeated or will cause problems over time. But the success rate for this particular procedure is incredibly high, and you really don’t; have much to worry about. The real problems occur later, during healing. Some people who have had implants inserted will eat the wrong kinds of foods, damaging or moving their implants. This can cause severe pain, infection and the need for additional procedures to be performed. Over time, the risks decrease, as the mouth heals up entirely. But even after months of having the implants in, there are still some dangers. If you do not take care of your teeth, gums and mouth, then you can cause the implants to fail. You need to brush on a regular basis to ensure gum and teeth health. This will keep the implants in place and limit your complications and risks. 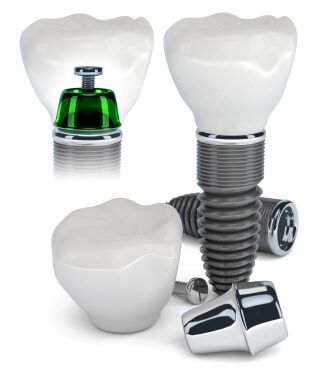 Generally, most dental implant patients experience no problems whatsoever with their implants. They may feel like the implants are uncomfortable at first, as they adjust to them, or they may not like the way they work as they chew or speak. But there should be little noticeable difference between the new implants and the old teeth. So long as they are taken care of, there is little chance that something will go wrong. Simply following the surgeon’s instructions will ensure that they last a long time and that no complications occur. There is some risk that implants will aggravate medical conditions that already exist within the body. If the patient has cavities in the areas surrounding the implant, those cavities can worsen with the presence of the implants. Also, some patients suffering from autoimmune diseases, such as HIV or AIDS, will be at risk of galvanization, where electrical currents are caused by the metal in the implants that harms the body. But these risks only affect a very small portion of the population.